History and Information on Rea Street at Digbeth in Birmingham in the County of Warwickshire. Rea Street connects Digbeth with Moseley Street and continues onwards as Rea Street South until the junction of MacDonald Street in the Highgate area of Birmingham. 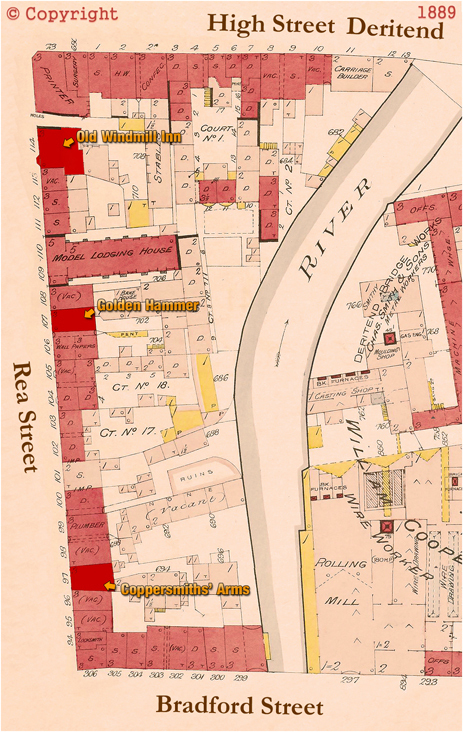 This page features both Rea Street and Rea Street South, though it is the former that is of greater interest in terms of public houses. Sadly, both thoroughfares have very little of historical or architectural interest remaining in the 21st century. 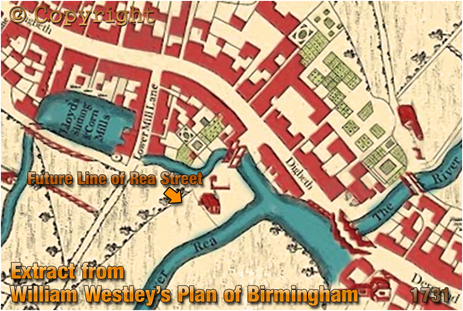 This extract from William Westley's Plan of Birmingham does not feature Rea Street as it had not been laid out by this date. The row of trees roughly follows the future line of Rea Street. Streets often followed such field boundaries. A key building on this plan from 1731 is Lloyd's Slitting Mill. Originally built to grind corn, the mill was later operated by Robert Porter and produced sword blades for the Parliamentary forces during the English Civil War. However, this led to its destruction by Prince Rupert's forces when they attacked the town in 1643. It was rebuilt and became known as Townsend's Mill after the tenant John Townsend. It had reverted to a corn mill but was converted to mixed use by the Farmer family and was known as Farmer's Slitting Mill. Charles Lloyd was the occupier by 1731 and it later passed to Sampson Lloyd II, a descendent of a Quaker family from Leominster whose son would later co-found the famous Lloyd's Bank in Birmingham. The area that would later feature Rea Street was once occupied by the tan yards of the Colmore and Elesmore families. The latter had rights to a water course which was employed in the washing of skins before drying on the edge of Mill Meadows, later known as Porter's Meadows. The aeration would have taken place roughly on the future site of the Anchor Inn on land around what would form the junction of Rea Street and Bradford Street. 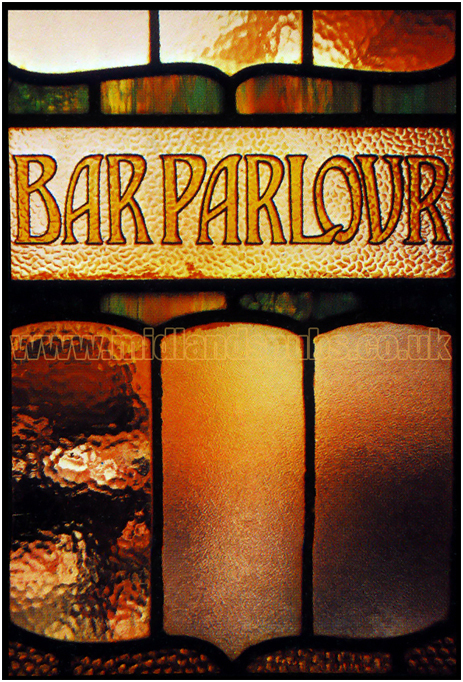 At one time the tanning industry was probably more important that the metal trades in Birmingham, though it should be remembered that there was some symbiosis as saddling craftsmen sourced their materials from the tanners and the smiths manufactured the tackle for harnesses. Originally called Bridge Lane, and later Long Bridge Street, Rea Street, along with other nearby thoroughfares started to be development in the mid-late 18th century. I am not certain, but I would imagine that the original name of the thoroughfare derives from the small bridge that can be seen on Westley's plan. The prominent building nearby may be a remnant of the old tanning industry. 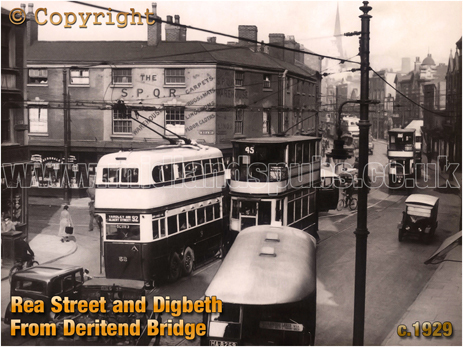 The earliest development took place at the junction with Digbeth. Rea Street roughly marked the demarcation between Digbeth and High Street Deritend - the shop on the extreme left-hand side of this photograph was the end of Digbeth. The building on the far corner, here trading as the S.P.Q.R. Warehouse in the inter-war years, once had a brewery connection. 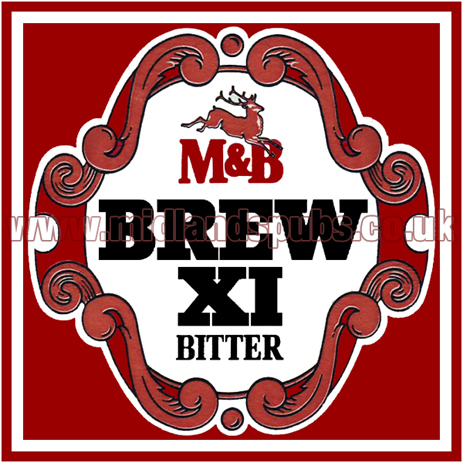 In the 1840s the premises were occupied by Charles Read who not only traded flour and corn but was a dealer in British wines and acted as an agent for the Banbury Brewery. By the 1860s two adjacent shops on the corner, Nos.71 and 72 Digbeth, was a large tobacconist's store run by the Swingler family. Next door was the shop, slaughter house and stables of a butchery business. Just around the corner in Rea Street was, during the mid-1840s, the location of the maltsters Greensill & Marton. This business was later run by the Palmer family. This corner block almost stood in isolation when captured on film in 1953. Indeed, it wouldn't be too long before these buildings were also cleared for road-widening. 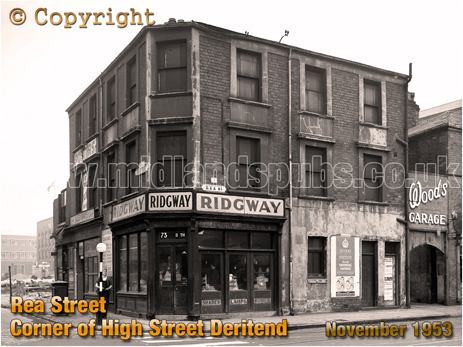 The business of Samuel Ridgway was known for steel tubular furniture though the shop front suggests its primary role was retailing lamps and electrical accessories. The shop was located at No.73 and was the last property on this side of Digbeth. To the right of the photograph one can see an entrance for Wood's Garage in Rea Street. This firm moved to a new service station on the corner of Station Street and Dudley Street. In the mid-19th century the corner shop was a grocery and provisions store run by Thomas Williams. The business had earlier been run by the Smith family in what was a relatively new building in 1860. This corner was either a later development or had to be rebuilt. The building on the extreme right of this photograph [to the right of the entry-passageway] was once the Old Windmill Inn. Beginning at the north-eastern end near the junction of Moseley Street, Rea Street South was developed earlier than many would imagine and properties were being advertised in the late 1850s. 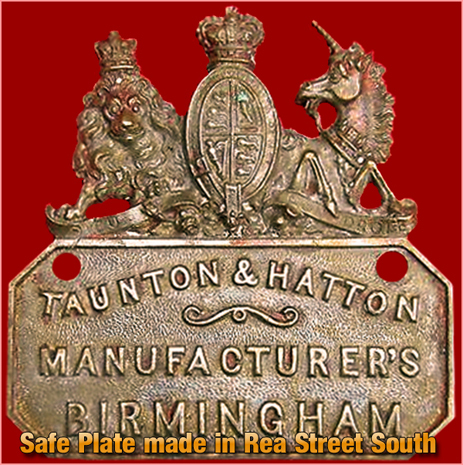 Indeed, the Vaughton Works of Taunton and Hatton was trading in Rea Street South by the summer of 1857; the firm had moved to a purpose-built manufactory from their previous premises in Oxford Street. This company were manufacturers of patent wrought-iron fire-resisting safes. Fitted with Cotterill's Locks, the company's safes were protected by steel plates to prevent drilling. Taunton and Hatton claimed they were the "strongest, best and cheapest safes made." The business was diverse in that they also manufactured metallic bedsteads. A business established even earlier, and prior to the sewerage drains being installed in the mid-1850s, was that of Messrs. Atkins saw manufactory. This firm appeared in the newspapers following a fatal accident in April 1854. Samuel Spriggs of Dimmock Street, an engineer, was working on the premises and employed in greasing a piston rod when his leg was caught between a crank and an iron support. The report stated that his leg was crushed in a dreadful manner. He was conveyed to the General Hospital, where he died soon afterwards. An inquest was held at the Grand Turk on Ludgate Hill, when a verdict of "Accidental Death" was returned. An advertisement dated October 1869 for an auction of leasehold properties near the corner of Moseley Street showed that Nos.1-7 Rea Street South were occupied and in the "respective occupations of Butler, Coward, Baker and others; together with the eight cottages in the yard at the back, in the occupation of Allen, Brawn, Phillips, Brody, Mason and others, with washhouses, and all necessary out-offices, spacious yard, pump and tap water." I have marked the locations of three Rea Street pubs located at the northern section of the thoroughfare on this plan extract dated 1889. If you have a genealogy story or query regarding Rea Street you can contact me and I will post it here in addition to including your message within the website pages for Birmingham Genealogy. If you would like to share any further information on Rea Street - Whatever the reason it would be great to hear of your stories or gossip. Simply send a message and I'll post it here. "Within the last six weeks several robberies have been committed on children by young girls. Today, a girl of fourteen, named Taylor, living in Rea Street South, was charged with taking an apron with a value of 6d., from a little girl eleven years-old, named Clara Roe, living in Rea Street. The little girl said that about eleven o'clock Monday morning she was sent to the washerwoman's for the apron, and on her return home again with it met the prisoner, who snatched the apron from her and ran away with it. About three o'clock the same afternoon witness again saw the girl, and told her father, who ran after the prisoner and brought her back. She then had the apron on. On asking her whether she stole it or not, she said she picked it up. On being told by the Magistrate's Clerk that if she did not plead then she would be committed for trial, she still said she was innocent, and was committed take her trial at the next Sessions." "Another Case of Robbing Children"
Birmingham Journal : July 30th 1859 Page 11. "The adjourned inquest upon the body of Elizabeth Osborne , wife of Robert Osborne, of 35, Rea Street, who died in the Queen's Hospital from injuries alleged to have been received at the hands of her husband on the 16th August, was held yesterday. It will be recollected that the deceased quarrelled with her husband on the 16th August, and a woman named Martha Horton said that she saw Mrs. Osborne throw an earthenware jug at the feet of her husband, who was standing in front of his door. The jug was broken, and Osborne picked up one of the pieces, and threw it at the deceased. The fragment struck her on the forehead, and caused a deep wound. Deceased fell bleeding to the floor. Mrs. Horton stated that both deceased and her husband were intoxicated. In the course of cross-examination by Osborne, who was present in the custody of Sergeant Marriott, Mrs. Horton said that the deceased did not fall upon her head. She was bleeding before she fell. Clara Morris also spoke to hearing the quarrel, and to seeing the deceased throw the jug. Julia Fraser said she met the deceased in the afternoon of the 16th August, and she was then intoxicated. She went to the house in the evening, having heard of what had happened, and when Mrs. Osborne saw her she said, "Look what he has done." When questioned, prisoner said, "It was her aggravating temper that caused me to do it." Deceased was an out-patient at the hospital from the 16th to the 21st ult., and after that date she was detained, her injuries having become serious. Mr. Phillips, house physician at the Queen's Hospital, deposed to the deceased being admitted to that institution on the 12th ultimo. Witness first saw her when she was detained, and she was then suffering from a wound two inches long on the left temple. Erysipelas had sat in, and she died on August 28th from exhaustion due to this. Had the deceased not have received the wound she would not have suffered from erysipelas. The fat condition of deceased and her previous habits of intemperance would predispose her to erysipelas. Detective Sergeant Marriott said he arrested the prisoner on the 24th ult., and charged him with violently assaulting his wife. The Prisoner said, "We had both of us been drinking, and had had a quarrel over some money matters. She picked up a jug and threw it at me. It dropped at my feet and broke, and I picked a portion of it up and threw it back again, and it struck her on the head." On the 28th witness charged the prisoner with causing the death of his wife. Mr. Weekes : "Why were the depositions of the woman not taken?" Witness : "I did arrange to have them taken, and went and saw Alderman Manton, and he promised to attend at the Queen's Hospital, but when I went and told Mr. Hebbert, the magistrates' clerk, he said that it was not necessary. He explained to me that if the woman was told by the doctor that she was about to die, and that if she made a statement in the presence of a witness, it would be equal to having her depositions taken before a magistrate. I then went to Alderman Manton and told him that he need not attend." Mr. Weekes : "You are quite sure about that?" Witness : "Yes." In reply to further questions, witness said that the deceased, when told that she was about to die, repeated in the presence of himself and Dr. Phillips her statement as to the throwing of the jug, adding that "he flung the missile with all his might." In summing up the evidence, the Deputy Coroner said that the case approached one of murder as nearly as any case could come that was not wilful murder, and he was not at all certain whether, if prisoner was committed, that he would not suffer the extreme penalty of the law. They must bear in mind that when the jug-throwing took place no expressions had been used by deceased to lead the prisoner to suppose that he was in danger of his life. A verdict of "Manslaughter" was returned, the foreman adding that he had been requested to state that the jury were of opinion that something should be done to ascertain whether or not the decision of Mr. Hebbert, that the woman's depositions were unnecessary, was a correct one. Mr. Weekes said it was beyond his province to make any comment as to the accuracy or otherwise of the magistrate's ruling, but he had no doubt that some attention would be paid to what the jury had said. Prisoner was then committed for trial." "The Fatal Quarrel in Park Street?" "On Saturday evening a woman named Catherine Gallagher, or Callaghan, was burnt to death in the sight of a crowd of people, who had been attracted to a court in Rea Street by the cries of a wife, whose husband, drunk and furious, was menacing her with violence. Mrs. Gallagher had intervened in the quarrel, and her clothing was set on fire with a lighted paraffin lamp, thrown at her by the inebriate. The name of this latter is Harry Spears, and, though too well known to avoid apprehension, he is still at large. He and his wife have not been long married. She is scarcely more than twenty years of age, and appears to have resisted, so far, the demoralisation of her sordid surroundings, for the neighbours speak of her as hard-working, clean, and sober. Spears, who is twenty-six years of age, has worked steadily, too, as an operative electrician for Messrs. Avery, the scale makers, and the pair have lived at 12 house, 9 Court, Rea Street, pretty prosperously, as people of their own station count. But the husband, though a well-disposed man for the most part, has often been drunk at weekends, and has shown himself very quarrelsome in his cups. Thus it comes about that people who knew the couple speak of their married life as an unhappy one. On Saturday night the weekly quarrel broke out between nine and ten o'clock. What the subject of dispute was does not seem to be known, and does not matter much. Little heed was paid to it by the denizens of the court, till Mrs. Spears, just before ten o'clock, ran out of doors and into Rea Street, shrieking "Murder!" and "Police!" While she was still looking for a policeman, Mrs. Gallagher, a feeble, grey-haired woman, who seems to have been respected by her neighbours, and to have often used her influence to make peace in their domestic squabbles, went in to Spears and sought to pacify him. Her intervention was ill-received, and seems, indeed, to have exasperated him to the pitch of frenzy. A younger woman, a Mrs. Battle, who had followed Mrs. Gallagher to the door of the house, called to her to come away "for God's sake"; and a less courageous person would have done so at once, for Spears, after shouting curses and threats at her, had seized a chair and swung it over his shoulder, intending, doubtless, to hurl it at the old woman's head, and he was struggling to free himself from the hold of one of his companions, who would appear to have been in the house from the first. Mrs. Gallagher was on the point of retiring, when Spears, letting the chair go, seized a glass lamp which was burning on the table, and flung it at her as she stood in the doorway. Striking her on the back, it was shivered into fragments, and she had not taken two steps into the court when flames were lapping her almost from head to foot. They lighted up the court, and showed it full of onlookers, but these, with fright written on their faces, shrank away from her, and for a moment she stood shrieking and helpless in the centre of a wide circle of them. Then a woman named Russell ran forward and threw her down, and rolled her along the pavement; but this measure, prompt, courageous, and well-intentioned enough, was unavailing, and the woman, scared in her turn, stood off, wringing her hands and railing at the crowd. "Is there never a man among you?" she cried; "My God! She's burning to death." The poor old creature had risen to her knees. She was battling with the flames, which enveloped now her head and face, and was swaying miserably from side to side. By another effort, she got upon her feet and staggered towards her own house, but as she reached the door she turned about and stood almost naked, for the wind had blown away the charred fragments of her clothing; and the people saw her clasp her hands, and saw the fear of sudden death in her uplifted face, as she cried incessantly, "Lord, have mercy on me!" Someone came at last with a blanket, and covered the frail, blackened form; but it was too late. She was borne to the Queen's Hospital, and her sufferings ended nine hours later. Meanwhile the insensate author of the mischief, half sobered by the sight of it, had made off in the confusion which it caused. Another man was taken in mistake to the lock-up, having been pointed out to Sergeant Dodds by Mrs. Battle, who, upon seeing him afterwards at Moseley Street police station, perceived that she had made a mistake. The court was very quiet yesterday, for everybody remained within doors, sympathising with the husband of the deceased, who is a cripple, and has done no work since he broke one of his legs last year; and with young Mrs. Spears, who seems greatly distressed. It is an ugly commentary on the case that in nearly every house in the court there is a cheap glass spirit-lamp, of the same dangerous make as that which Spears picked up as a handy missile. The Birmingham City Police have issued the following description of the accused : "Harry Spears, age 26, height 5ft. 4ins., dark hair, blue eyes, thick sandy moustache, cut off at ends; high forehead, long features; scar on right side of chin, about two inches long; stiff build; dressed in light round jacket and vest, trousers of the same material, but faded, hard black billycock hat, white collar, blue-and-red striped cotton tie. He is by trade an electrician, and resided at 9 Court, 12 house, Rea Street, with his wife Anne Spears." Several facts are known with reference to Spears's habits which render his apprehension still more a matter of certainty than in the ordinary course of things it would be. He is known, moreover, to several members of the city police, and they have been put in plain clothes, and given leave to devote their whole time to his pursuit. He formerly lived in Park Road, Aston." Birmingham Daily Post : March 9th 1891 Page 4. "Yesterday morning, Mr. Hawkes [coroner] held an inquest at his court, Moor Street, concerning the death of Catherine Gallagher , who lived in a court in Rea Street. Harry Spears, who was charged with causing the death of the deceased, was present in custody. Superintendent Hervey and Detective Sergeant Bristoll were present representing the police. Mr. Peet appeared for the accused. Michael Gallagher, husband of the deceased, gave evidence of identification. Ellen Battle, living in a court in Rea Street, stated that shortly before ten o'clock on Saturday night she heard a disturbance in Spears's house. She saw Mrs. Spears, prisoner, and Mrs. Gallagher come from the house, and the two former were apparently quarrelling. Mrs. Gallagher asked them not to quarrel; prisoner and his wife then re-entered their house. Mrs. Gallagher followed. Prisoner was very drunk. Soon after the parties entered the house witness saw a chair thrown through the door. Witness corrected herself and said that Mrs. Spears did not enter the house. Mrs. Gallagher was trying to pacify Spears, and his wife came to the door and called him something, but witness could not catch the words. Mrs. Spears caught hold of deceased and said, "Come out for God's sake; he's raving mad." A young man named Green came up and said he would see if he could pacify prisoner. At that time deceased was behind the door. Mrs. Ryder, a neighbour, came to the house door, and prisoner picked up another chair and made use of a threat towards Mrs. Ryder. Green took the chair from prisoner, who then picked up the lamp which was burning on the table, and threw it towards where witness and Mrs. Gallagher were standing. The glass of the lamp smashed on the floor, and in a moment deceased's clothes were in flames. Witness shouted "For God's sake come out or you'll be burned to death." Witness had a baby in her arms, and she ran to get someone to take it. When she returned Mrs. Gallagher was in the yard, and someone was rolling her on the floor. By Mr. Peet : She could not say whether prisoner did anything to aid deceased; the crowd got round too quickly. Mary Francis, 9 Court, Rea Street, said that about half-past nine on Saturday night she was at her door, and noticed Spears's house door open. There seemed to be a quarrel going on in the house. Witness saw Mrs. Gallagher in Spears's house. A paraffin lamp was on the table, and witness saw Spears throw it towards the door, where Mrs. Gallagher and Mrs. Battle were standing. The lamp smashed to pieces on the floor. The lamp broke near to where Mrs. Gallagher stood. The vessel struck the wall near the door. After Mrs. Gallagher was on fire prisoner tried his utmost to extinguish the flames. Frank Green, living in a court in Rea Street, said that he knew Spears, and met him in the Royal Oak, Cheapside, at half-past seven on Saturday. 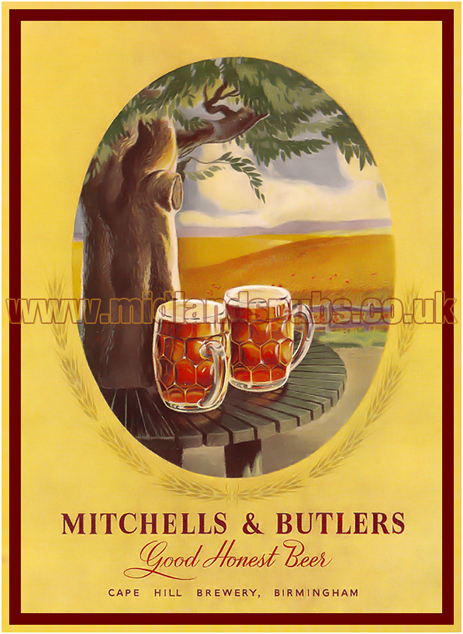 They remained drinking until half-past nine. When they left he accompanied Spears to the top of the opening leading to his home. Spears was the worse for drink. Witness went on to the next court. A few minutes after he heard a noise in Spears's yard, and went round. He saw Mrs. Spears in the yard, and deceased and another woman were standing on the doorstep. There was a paraffin lamp on the table in prisoner's house. When witness went into the house Spears said to him "Look here what she's done," pointing to the back of his head, which was bleeding. Mrs. Ryder came into the house, and said something to Spears, who picked up a chair, and said, "I'll kill the bloody lot." Witness took the chair from Spears, and the next moment he heard a crash of glass. On turning round he saw Mrs. Gallagher running into the yard in flames. Prisoner followed, and tried to put out the flames by rolling the woman over. Catherine Ryder, 32, Rea Street. prisoner's mother-in-law, said that she heard the disturbance at Spears's house, and went to see what was the matter. Witness asked Spears what he was doing, and then left the house. Green and Gallagher were in the house. Spears seemed raving mad. Witness went home, and the next thing she heard was that Mrs. Gallagher had been burned. Witness knew the lamp, the vessel of which would hold about one pint of oil. Frederick William Carter, 104, Rea Street, said that hearing screams in the court he ran thither. He saw Mrs. Gallagher in flames, and helped to extinguish them by rolling her on the ground. Witness got some blankets and put them round her. A man named Smith lent witness his coat to help to extinguish the flames. Police Constable Burrows said that about ten o'clock on Saturday night he heard of the occurrence at Spears's house, and went there. He could not find Spears. Mr. L. P. Gamgee, Queen's Hospital, said that deceased was admitted to that institution at 10.15pm on Saturday night. She was suffering from severe burns to the trunk, both legs, the left side, face, and arms. She lived till twenty-five minutes past seven the following morning. The cause of death was collapse, the result of the burns. In the fragments of deceased's clothing, which witness had examined, he had detected the presence of paraffin. The Coroner said that he was quite sure from the brevity and simplicity of the narrative it was unnecessary for him to occupy many minutes in recounting the circumstances of the case. They had Spears going home, after drinking for a couple of hours, and evidently there was some quarrel between himself and his wife. In that condition of things the deceased, with good intentions, intervened, and went into the house. In a very few minutes the whole thing was over. Spears threw one chair, and a second one was taken from him by the witness Green. He then picked up a paraffin lamp, which contained, or might have contained a pint of oil. The lamp was thrown in the direction of deceased, it broke, and the paraffin ignited deceased's clothing, and she was burned to death in a shocking manner. The only redeeming part of the case was the action of the two men who sensibly extinguished the flames, in fact before they reached her face. If they believed Spears threw the lamp wilfully it was a wilful murder. The coroner then explained the law bearing on the case, and said the jury must take it from him, and if his law was wrong it would be corrected elsewhere. The case was one of murder or nothing. What they had to consider was, did the man know he was throwing the lamp with the knowledge that it contained something of a deadly nature? If so, the indictment must be one of wilful murder. The jury retired to consider their verdict, and after ten minutes' absence returned, and recorded a verdict of "Wilful murder against Spears." - The accused was then committed to the Birmingham Assizes for trial. Later in the day the prisoner was brought before the Stipendiary, when the evidence given before the Coroner was repeated, and the accused was committed to the assizes for trial on the capital charge." Birmingham Daily Post : March 11th 1891 Page 6. "The Judge, in summing up the case to the jury, said : "they would have to consider whether the death of Catherine Gallagher was caused by the prisoner, Harry Spears, wilfully throwing the lamp at someone in the room, or whether the lamp was broken through his criminal negligence. 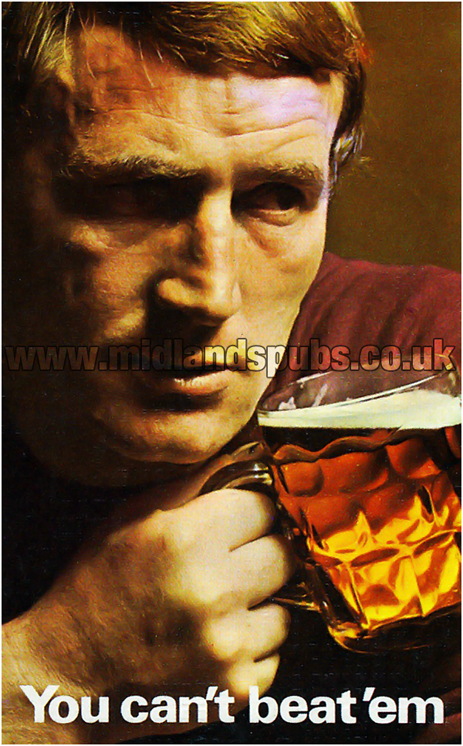 This was another case due to the Saturday night drunkenness which so much prevailed in our large towns. Although drunkenness was no excuse for a crime committed it was often an important element in distinguishing the degree of the crime. 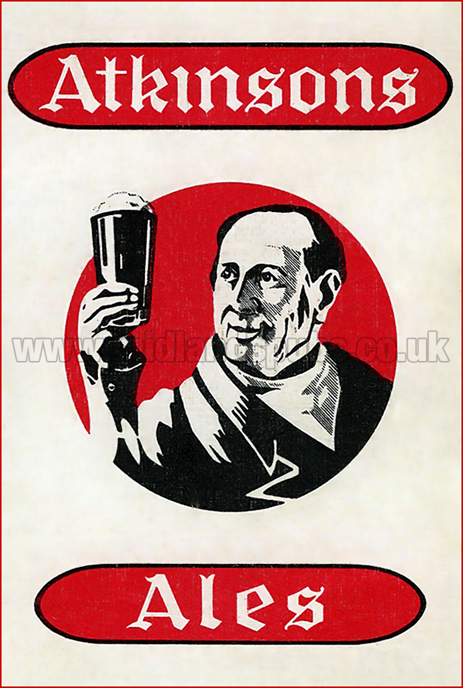 A man who did a thing when in a state of extreme drunkenness could not always be credited with the same intention that a man would have who committed the same crime when sober. It was very difficult to look upon the present case as one of pure accident, although it was quite within the province of the jury to accept that view. Then they would have to acquit him. If, however, they thought he threw it at the wall with the people about the room, or that he knocked it off the table without regard to consequences it was clearly a case of manslaughter, and he could not see much moral difference between the two acts. The jury, after retiring for a few minutes, returned a verdict of guilty, and recommended the prisoner to mercy on the ground that he tried to extinguish the flames. The foreman explained that the jury were of opinion that the prisoner threw the lamp at the wall. His Lordship, in passing sentence upon the prisoner, said he had been convicted on very clear evidence of causing the death of Mrs. Gallagher by an act of the most reckless and wanton character. The throwing of lighted paraffin lamps had become almost a matter of course amongst a certain class of people when drunk. The prisoner had evidently had had a good character given him which seemed inconsistent with his getting shockingly, disgracefully, and disgustingly drunk. He should treat the prisoner as he should any other person who had given way, as a consequence of drink, to a violent frenzy and passion, and then committed an act of utter and absolute recklessness. He did not suppose for a moment that the prisoner intended ether to cause death or extreme bodily harm to anybody; but he could not have thrown the lamp without the notion of doing possible harm or some sort or another to somebody, and but for the recommendation of the jury he should have sent him to penal servitude. Although no one could feel more sorry for the prisoner than he felt, he could not pass over the matter lightly. It was necessary for the protection of society that people should be made to understand that such acts could not be committed with impunity. The sentence would he one of eighteen months' imprisonment, with hard labour." Birmingham Daily Post : March 18th 1891 Page 7. In the census of 1891 Harry Spears is recorded as a prisoner at Winson Green whilst Annie Spears remained as a resident in 9 Court, Rea Street. The couple remained together following his prison sentence. They later lived in Bordesley Park Road from where Harry Spears worked as an electric switch maker. They had a son, also named Harry, in 1899. Harry Spears later became a window cleaner and the family moved to Cregoe Street by the end of the Edwardian period. "John William Cant , coach-builder, Rea Street, was charged with assaulting a young man named Thomas Richardson, a bedstead fitter living in Bissell Street, and stealing his watch. On Saturday night, about 11.15, prosecutor was passing along Rea Street with his sister, on his way home, when he saw a disturbance an the other side of the street. He crossed over and enquired of the prisoner what was the matter. The prisonor made no reply but knocked him down, and while he was on the floor disconnected his watch from the chain and stole it. The prosecutor's sister, when she saw her brother being knocked about, crossed over to him, and when the prisoner had him on the ground laid hold of the watch chain, so that the watch should not be stolen. The prisoner, however, succeeded in getting away with the watch. Information was given to the police, and prisoner, who was well known to the prosecutor, was arrested the same evening. The watch was not found on him, but was discovered in the gutter near where the assault took place. The Bench said there was some doubt to whether Cant really meant to steal the watch, but they thought there was sufficient evidence to go before jury. They accordingly committed him to the sessions, bail being admitted in two sureties of £l5. each. Mr. Smith Dorsett appeared for the defence." "Assault and Alleged Robbery in Rea Street"
"The two youths - Joseph Frost, Angelina Street, and Thomas Larvin, Watery Lane - who were remanded at the Birmingham Police Court on a charge of wounding John Keys, Rea Street, were again brought before the Stipendiary [Mr. T. M. Colmore] today. It was from the description and information given by an independent witness that Detectives McAuley and Barnes arrested the prisoners at a local music hall the night after the affray. For the defence several witnesses were called for the purpose of proving an alibi, and one of these - Frost's sweetheart - deposed that she stood at the corner of a street with him for three hours. The Stipendiary described her evidence as absurd, and refused to hear her further. Frost, who it will be recalled, was alleged to have stabbed the prosecutor in the neck, was sentenced to two months' imprisonment with hard labour, whilst Larvin, who kicked Keys, received a month with hard labour." Birmingham Mail : March 15th 1894 Page 2. "This morning, John Corley , court, Rea Street, was taken to the Queen's Hospital suffering from two severe fractures - one on the head and another on the right arm - and other injuries about the head and shoulders, which he stated had been inflicted by his son this morning. 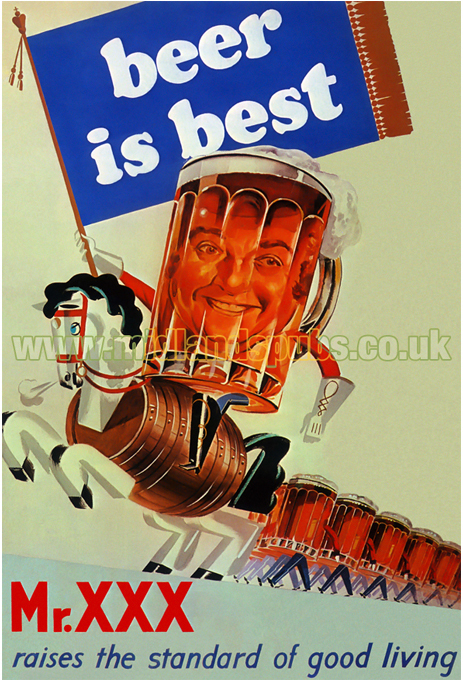 It is alleged that the son, who is about 30 years of age, was at Warwick races and came home late night drunk. When he got up this morning he went into his father's room and was fumbling among the contents of a box, when the old man, who had been in bed for three days through rheumatism, woke up and asked him what he was doing. The son, in reply, cursed his father, and seized a thick oak stick, about four feet in length, and beat him about the head and shoulders till the stick broke. The injured man's cries attracted assistance, and he was taken to the polioe station, and afterwards to the hospital, where, after the wounds had been dressed, he was dismissed to be treated as an out-patient. A warrant has been issued for the apprehension of the son." "Brutal Assault on a Father"
Birmingham Mail : August 29th 1883 Page 3. "Shortly before midnight the brigade were called to a fire in Rea Street. The fire was discovered about a quarter to twelve on the premises of Messrs. Fisher and Ludlow, tinware manufacturers, by a woman who lives in a neighbouring house. A constable obtained admission to the premises, and called up the brigade by telephone, but he was just anticipated by a telephone message from Moseley Street Police Station. The call was received at five minutes to twelve. Mr. Teviotdale [assistant superintendent], turned out with a steamer and tender, and the fire escape from Moseley Street was also in attendance. The premises are mostly hidden from the street by a row of houses, and the fire probably had gained a good hold before it was discovered. When the brigade arrived both floors of a two-storey building forming part of the works were well alight. The upper floor is used as a polishing shop, and the lower as a packing-room. While the firemen were at work the fire burst through the roof, causing a glare which was seen from the centre of the city, the flames shooting up for a minute or two so high as to appear from the Bull Ring to rise above St. Martin's Church. In about three-quarters of hour the brigade with three jets from the main had the fire practically extinguished, and left the premises with three men in charge. The building and contents were severely damaged, the destruction having been so great that it could not be discovered in what part of the building the fire started, or what was its cause. The works are closely surrounded by small houses, many of them old, and the promptness with which the brigade checked the fire when they arrived averted serious danger to life." "Serious Fire in Rea Street"
Birmingham Mail : January 12th 1900 Page 2.